After securing the domestic ‘Double’ in 1961, Tottenham Hotspur went into the following season’s European Cup competition with an ambition born of conviction. They would, however, come up short against Benfica in the semi-final. Furthermore, the exertions in Europe may also have compromised their domestic league campaign, and Bill Nicholson’s team ended up in third place. They did however retain the FA Cup, with a 3-1 victory over Burnley. The title went to Ipswich Town, under the guidance of Alf Ramsey. The Suffolk team would fall against AC Milan in the European Cup, after romping through the preliminaries against a Maltese side. For Spurs however, it was the Cup Winners Cup, and although the poor relation of European club competitions, lifting the trophy would still give the North London club the not inconsiderable distinction of being the first British club to triumph in such company. The so-called ‘push and run’ play pioneered by Nicholson had led to Spurs being widely acknowledged as England’s premier club at the time and with Jimmy Greaves back from his Italian adventure in Milan and at his goal-scoring peak, the White Hart Lane team were a formidable unit. The ‘Double’ had cemented their place in domestic football history, being the first club to achieve the distinction in the 20th century. To put a gloss on their ‘Glory, Glory’ years though, a European trophy would be the ideal accolade. Being a mere single step from the final, the loss to Benfica had seemed so much more painful. It hardly helped that Greaves had seemingly legitimate goals disallowed in both legs against the Portuguese champions, the one in Lisbon being particularly scandalous as the arch poacher was ruled to have been offside when there were Portuguese defenders standing on the goal-line. It had been an ultimately frustrating competition for Spurs but may well have been the time that built the resilience and determination into the team that would serve them well the following term. Unlike Ipswich Town’s fate in the European Cup, Tottenham escaped the probably tiresome rigours of having to compete in the Preliminary Round, and their initial task in the Cup Winners Cup was a match against Glasgow Rangers in the First Round. Such inter-British encounters are often termed as being a ‘Battle of Britain’ and this was no different. Rangers were at the time in the midst of a run that would see them gain the Scottish championship six times across a nine-year period and wily manager Scot Symon had built the club into a unit that expected to win silverware. They would have had little fear of facing Spurs. It’s often the case that English clubs have been troubled in these semi-domestic encounters, especially when the first leg is played north of the border. On this occasion, the draw meant an opening home leg for Tottenham, and a comfortable victory all but negated any trepidation that may otherwise have been the case for the journey over Hadrian’s Wall. Ahead of the game played on the last day of October, Spurs had been progressing well in the league, having lost only three of their first fifteen fixtures. Nicholson may well have been aware of the danger Rangers would present though and fielded a strong team for the White Hart Lane clash. Only Bobby Smith was missing from the team that had retained the FA Cup a few months earlier, and Les Allen fitted seamlessly into the slot that the England striker had left. Having three Scots in his team – John White, Bill Brown and Dave Mackay – also added a little piquancy to matters, and it took the former only four minutes to break the deadlock. In fact, the Scotland international inside forward, who would be tragically killed by lightening whilst sheltering under a tree at a Crews Hill golf course, would be the star turn of the evening, netting a brace. A header from a Greaves corner settled early home fans’ nerves, but five minutes later, Rangers had squared things as Willie Henderson netted. The lead was re-established halfway through the first period though when White reprised his early trick by nodding in from another Greaves corner. The battle was virtually done and dusted before the break as Allen added a third, and an own goal from Bobby Shearer looked like giving Spurs a three-goal advantage to take in the break. A late goal by Jimmy Millar offered a little hope for the visitors, but at 4-2 ahead, it seemed a safe home win. A goal from Maurice Norman with a dozen minutes to play locked out the result and it would now require a monumental effort by Rangers to deny Spurs progress. Form can be a tricky thing to manage though and in contrast to the run going into the first leg, a few slips suggested that all may not be well before the London club took the road to the north. Their previous four games had brought home draws against Sheffield Wednesday and Everton, and away defeats at Burnley and Bolton. If Spurs were to prosper and register a serious challenge in the European competition, manager Bill Nicholson couldn’t allow any further slips. With representatives of the ‘Auld Enemy’ in town, and a team from the metropolitan heartland of power to boot, a full Ibrox was guaranteed, as was the raucous reception for Spurs as they entered the field. In such games, an early goal for the home team can make a three-goal advantage appear borderline tenuous. After eight minutes though, it was the visitors who scored. Bobby Smith was by now entering the salad years of his time with Nicholson’s team, and would leave the club the following year for the quieter pastures of Brighton and Hove Albion. His 176 league goals for the club in 271 games however, spoke of his prowess in front of goal and despite discussions in the press, and Allen’s goal in the home leg, Nicholson had little hesitation in returning the forward to his starting team for the player’s first game since August. Smith instigated the attack and Greaves was on hand to put the ball home. It meant the advantage was now four goals, and virtually put Spurs out of sight. Understandably, the goal took a little of the steam from the home team’s drive and at the break there was no further score. A crowd of some 80,000 or so Glaswegians were ill-prepared to go down without a fight and perhaps fortified by half-time beverages, they roared Rangers on at the restart. The drive and enthused impetus brought almost immediate success. Less than two minutes had ticked by when Rangers levelled on the night. It was hardly enough to cause serious tremors in the visitors’ ranks, but gave a large dollop of hope to the Rangers fans in the crowd and the home team battled forwards in a gallant quest to create a miracle. Just three minutes later though, the fragile bubble of faint hope was burst when Smith netted from White’s cross. There would be no comeback now and most around the stadium knew it. It was therefore something of a gesture of defiance when Rangers equalised again with a quarter-hour remaining, but for good effect, Smith rounded off the scoring just before the end to give Nicholson’s team a worthy victory and justify the manger’s’ selection. European consideration could now be put away until the New Year, allowing Spurs to concentrate on domestic matters. The victory in Glasgow may have been the impetus that the club needed after their questionable run of results going into the game, and despite an unwelcome and broadly surprising 0-3 reverse to Burnley in the FA Cup, five wins and a draw in six league games suggested an upswing. The performances were probably worthy of increased merit as well, as inspirational skipper Danny Blanchflower had missed all of the games since the Ibrox encounter due to a troublesome knee injury. It would be 5 March before the Cup Winners Cup matches returned, and the draw had paired Spurs with Czechoslovakian club, Slovan Bratislava. Among the English footballing fraternity, little was known of the club from the capital of the Slovakian region of the country but it was widely expected that, having dispensed of Rangers, this match up would provide Spurs with a fairly untroubled passage into the semi-finals. As is often the case when lack of knowledge is taken for conventional wisdom though, assumptions can be wildly inaccurate. Czech football was on the rise, witnessed by the fact that the national team had only lost out in the World Cup Final in Chile the previous summer, after going a goal ahead against Brazil. Spurs arrived in a rainy Bratislava and were greeted by a pitch that looked anything but ideal for their type of game. Muddy and with patches barely covered by grass it was uneven and likely to impair any aspirations for controlled passing football. For the home team though, it was the surface they were used to performing on and, when the game started, whilst the Spurs players often took on the appearance of Bambi on ice, the home players were surefooted and skipped across the surface without apparent concern. On top of that, Slovan were anything but a poor team. Accomplished and confident, they knew that a home win was essential if they were to have a decent chance of winning the tie. It was something they achieved with a measure to spare. To be fair, in the final analysis, Spurs may even have been fortunate to escape with just a two-goal deficit after a torrid evening. Blanchflower was still missing, with Tony Marchi stepping into the considerable breach. How valuable the Irishman’s cool authority and cajoling of team-mates might have been when the home team were pressing is open to conjecture, but it was an asset unavailable to Nicholson, and with Frank Saul deputising for Terry Medwin, the Spurs team had a makeshift look about it and its deficiencies were quickly exposed. The home team began at a helter-skelter rate and whilst unsure footing and a rumbustious home crowd unsettled the visitors, Slovan made hay. Brown was frequently under pressure and called in to the game on a number of occasions. Eventually the dam was breached when a clever ball inside of Peter Baker left Brown exposed and the ball was expertly placed past him. With 30 minutes gone, things were looking rough for Spurs. Resolute defending and an increasing awareness of the restrictions imposed by the surface kept the ship afloat though and no more goals were conceded by half-time. The restart saw an increased frenzy in the home attack. The sight of Spurs hanging on may well have suggested that there were more goals for the home team if they continued to press, harry and attack. Inside the first few minutes of the second period, Brown again was called on to save Spurs and a blocked shot also denied the home team with the ‘keeper seemingly beaten. On 55 minutes though, the second goal came. A cross from the left was headed home by Anton Moravčík, with Brown just a helpless spectator. With still more than 30 minutes to play and the home team rampant, any further goals conceded could have delivered serious damage to North London aspirations of a place in the last four and given the home team a perhaps unassailable advantage, with a commensurate boost of confidence, before the return leg. A combination of resilience and anticipation by Brown though, and a strange apparent reluctance to press home the advantage they had with Slovan seemingly content with the score line and keen not to concede, the time slipped away. Spurs were probably glad to be heading for home still with a realistic chance of turning things around at White Hart Lane. There was just one Division One fixture before the home leg to be played, before the return leg on 14 March. A two-goal victory thanks to strikes by Frank Saul and Cliff Jones was an ideal confidence builder ahead of what, after the first leg, now looked like a sizeable task if the tie was to be turned around. With Blanchflower still missing, it was a side little changed from the one that had been so badly mauled by Slovan in Central Europe nine days earlier. Tottenham were now facing the sort of task they had imposed upon Rangers in the earlier round, and much as with that game, an early goal for the home side would have been the ideal stimulus. Unsurprisingly, Nicholson sent his team out with orders to set the pace in a game now played on a pitch much more suited to their style of play, and they laid into the visitors with gusto. Pressure mounted and the visitors’ back line creaked and groaned but refused to buckle. Anton Bulla, Slovan’s coach, was also keenly aware of the implications of an early goal for the home team and had drilled determination into his players. Time ticked on and as it passed the half-hour mark with the score line still blank, the visitor’s confidence grew, just as Spurs’ attacks seemed to be running out of ideas. It would take something special to prise open the door, but just a minute later, it would arrive. Mackay fired a shot in and it eluded the goalkeeper to offer an opening of the door. Not long afterwards, Spurs would kick that same door down with another couple of strikes ahead of the break. On 44 minutes, Greaves found space in the area to fire high into the net and wipe out the visitors’ advantage. Things were all square again, but not for long. Just before the half-time whistle, a cross from the right saw Smith deliver a header, towering above the goalkeeper, and Spurs were ahead. In the home leg, Slovan had been inspired by the break and came out with guns blazing at the restart. This game would be different. Spurs were now the dominant team in terms of score line, play and confidence. Slovan looked a beaten side and for the next 20 minutes or so, Spurs were to consolidate their lead, denying any opportunity for a counter strike. On 65 minutes a clever strike by Greaves ended the contest in any meaningful way. Things were running strongly in Spurs’ favour. This was emphasised on 75 minutes when Jones rushed in to make contact with a cross from the right, and his run took him into a collision with the goalkeeper, and the ball ended up in the back of the net. Even in such rough and tumble days, well before the last line of defence was treated to the sort of protection as is the norm today, it may well have been a foul on another occasion. The referee however saw nothing wrong and awarded the goal. Jones was credited with the strike, although film would later suggest that he headed the goalkeeper not the ball, and it was the unfortunate number one who actually put the ball into the net. It was left to White to deliver the final goal. Spurs had delivered six of the best, and Slovan had been well and truly spanked. Despite a torrid first leg experience, Spurs had climbed off the floor and delivered a knockout blow. They were through to the semi-finals of the Cup Winners Cup. Although a romping win for Spurs, the result seemed to have little positive effect on the club’s domestic form. It would be just over a month before the first leg of the semi-final tie, and in the intervening nine games, Nicholson’s team would win only three times, although also only losing three. The form was patchy at best though, and certainly not the sort of league dominance that had brought the title to White Hart Lane a couple of seasons back. Although they would end the season having notched 111 goals across the league season, substantially more than any other club, Spurs would finish in second place. Their league title success two years earlier would, at the time of writing, be the most recent occasion when they have topped the standing at season’s end. From then on in, it would be cup competitions taking glory to White hart Lane, and in the Cup Winners Cup, they were now just two ties from lifting the trophy. The draw for the semi-finals saw Spurs paired with the Yugoslavian club, OFK Beograd, with the first leg to be played in Belgrade. As with Slovan Bratislava, little was known of the club, but given the fright Spurs had received from the visit to Czechoslovakia, they would have been minded to avoid a repeat scenario in Belgrade. On 24 April, Spurs took the field for a game that would have a number of ups and downs. Nicholson opted to bring John Smith into midfield to replace Cliff Jones and Terry Dyson was reinstated on the right flank. The early part of the game seemed to bode well as Spurs dominated much of the early play and it was little surprise when they went ahead after 26 minutes. A free-kick was played into the home penalty area by Tony Marchi, Bobby Smith headed down and White volleyed home. The reverse stung Belgrade into action though and ten minutes before the break, they equalised when Milorad Popov beat Brown from the penalty spot. Things would initially get worse for the visitors after the break. Jimmy Greaves had endured a number of niggling fouls on him, some unnoticed, or at least unacknowledged by Hungarian referee, Lajos Aranyosi. Ten minutes after the restart, the striker’s patience snapped and he petulantly kicked out at a defender. As is so often the case in these situations, the referee sprang into action and dismissed Greaves. It was the first time he had been sent-off in his career to date, and the first time that a Spurs player had been dismissed from a competitive match in almost 40 years. Ironically, when Greaves reached the touchline, the person consoling him was Spurs trainer Cecil Poynton, the previous Spurs player to have been given his marching orders all those years ago. To many, it seems a little unjust that a player who has been maltreated for a period of the game receives the ultimate punishment when the pain and anger temporarily gets the better of him. Retaliation is so often deemed by officials to be worse than the crime that caused it. Intuitively, it feels wrong, but is the dominant pattern. Spurs fans would surely have felt aggrieved, as the player clearly did. If, however, the home team thought that the balance of play would now swing in their favour, they were to be disappointed. Whether through some kind of righteous indignation, or a pugnacious refusal to be shaken from their dominance of the game, Spurs continued to have the upper hand across the contest and when Terry Dyson scored to give the visitors a well-merited victory, it seemed that justice had been done. With the home leg to come on 1 May, Spurs had one foot in the final of the Cup Winners Cup. There was a single league encounter for Spurs to complete before the return game, and a 4-1 home thumping of Bolton with goals from Greaves, Marchi, Smith and White would have been just the sort of performance craved by the fans and demanded by Nicholson to send the club into the second leg in the right frame of mind. Back in North London, confidence levels for the second leg was boosted by the news that Blanchflower would be available. When the team was announced, few would have been surprised to see the manager drop his on field general immediately back into the starting eleven. A shuffling of his players meant that Marchi retained a starting berth, filling in for Dave Mackay, with the combative Scotsman moved further forwards. Greaves was absent thanks to his dismissal in the away leg. The astute move by Nicholson to move Mackay into the heart of the encounter brought massive dividends as the Scot delivered a virtuoso performance, covering defence as the visitors pressed both surprisingly and with firm resolve early on and also dominating the middle of the pitch, promoting attacks. OFK Belgrade had not come to London to lay down and die. They clearly thought there was still plenty of life in the game, and their early forays sought to provide strong evidence of such beliefs. The first period was halfway through when the breakthrough came. Mackay had been much occupied shoring up the home backline, but Brown still had plenty to do to keep the visitors out. Until now only a shot by White, firing wide of the near upright after skipping inside a defender had given the home fans much to cheer. But the dynamic Mackay would change that. Hitting a low shot inside the far post, he put Spurs ahead, increasing their advantage and, as many thought at the time, largely putting the tie to bed. The Yugoslavs were still dangerous though and six minutes later, the scores on the night were level. A cross from the right caused a measure of panic in the home defence, and Josip Skoblar equalised. The goal sent shock waves through the home fans. One more strike from the visitors and things would be all square. The final that looked like it was in Tottenham’s hands for the taking, suddenly seemed to be much less than certain. At such times, there is a need for a commanding figure on the pitch, someone who can rise above the hurly burly of the action and offer a calm, commanding control. Whilst Mackay busied himself hurrying from here to there as required, it was the reassuring calmness of Danny Blanchflower that kept things moving in the right direction for the home team. That ability to keep things on track was rewarded just before the break when Mackay’s earnest endeavours saw him pass to Jones who fired home to restore Spurs’ two goal advantage. Surely the visitors were done now. A brief flurry from the Yugoslavs after the restart was as ineffective as Tottenham’s reply was decisive. A cross from the left and a Smith diving header put the cap on things. There was no way the visitors were going to score three times and although they continued to press, the home defence was resilient. Despite some disagreeable physical confrontations brought on by frustration from the visitors, the game drifted away from them and Spurs had booked their place in the showpiece final at Rotterdam’s Feijenoord Stadion, on 15 May. If, aside from Glasgow Rangers, Spurs had faced little-known teams on their short run to the final, that would hardly be the case in the Rotterdam encounter. Waiting to contest the final would be Atlético Madrid. With the tournament still in its infancy, this would be only the second time that a Cup Winners Cup Final had been played out as a one-off match. In its initial format, the trophy was decided across home and away legs with Serie A side Fiorentina defeating Rangers, Spurs First Round opponents. Twelve months before Spurs faced the Spanish team in the final, it had been Atlético lifting the trophy after defeating Fiorentina. Could fate repeat itself with the holders returning to the final and losing again? Tottenham had two league encounters to complete before the big day and if a 4-2 home win over Sheffield United fitted the bill nicely, a 1-0 reverse at Maine Road was hardly ideal. There was a further downside as well. Absent from the Manchester City league game was hero of the home leg against Belgrade, Dave Mackay. Injury not only meant that he missed that game, he would also be absent for the final. The loss of the Scot was a big blow and meant an even greater emphasis fell onto the now 37 years-old shoulders of Danny Blanchflower. The Irishman was still struggling from the knee injury sustained against Rangers way back in December of 1962, but his presence, especially with Mackay absent was now even more important. Not selecting him for such a pivotal encounter was hardly an option that Nicholson wanted to contemplate. Nevertheless, placing full trust in his skipper, he left the final decision with the player himself. Blanchflower, much as the manager would surely have suspected he would have done, declared himself fit, or at least ready, to play. It was a pivotal decision and one that even had an effect on matters ahead of the game. Later, Jimmy Graves would relate the scene in the dressing-room as Nicholson spoke to his players. “Bill began systematically to go through the strengths of each player, only for Danny to jump in and stop him in full flow,” the striker recalled. “’Danny poured cold water on the merits of the Spaniards and reminded us all of our, to his mind, superior qualities as individuals and as a team. Bill Nicholson took a back seat and Spurs’ success in that final was in no small way down to Danny and the proactive stance he took in our dressing room before the game.” It’s an enlightening tale of the bond between manager and captain. Some managers may have baulked at being spoken over by one of his players, but such was the trust Nicholson had in the eloquent Irishman and his empathy with the rest of the team that he was content for the captain to hold sway. Nicholson’s assessment of the Atlético team, stopped in mid flow by Blanchflower, was probably no overstatement of their capabilities. At the time, Atlético’s cross-city neighbours were dominating European club football with their grip on the European Cup, and with Sabino Barinaga also holding the other European club trophy available, Madrid was the centre of European footballing power. The holders were clear favourites to retain the trophy whilst Spurs were seen as being in decline after their glorious Double of a couple of seasons ago. The result would confound such assessments and offer the 4,000 or so travelling Spurs fans a ‘Dutch treat’ to remember. Early on, it seemed that the European pedigree of the holders would prevail as they pressed forwards, compelling Spurs to defend their goal. When the first goal came though, it was at the other end of the field. Smith fed a ball inside the Spanish left back allowing Jones to gallop forward and cross. Dyson closed in drawing the defenders towards him, but the ball flew over his head to where Greaves had made an astute late run. The striker’s penchant for finishing off such chances came to the fore and, perhaps against the run of play, Spurs were ahead. The Atlético defenders looked at each other questioningly. Who should have been picking up Greaves’ run? Spurs players’ celebrations suggested that they cared not a jot for the answer. Less than 20 minutes later, they would double the advantage. This time, it was Greaves throwing a cross into the box from the right. Again, it passed the crowd in the centre of the area and escaped towards the far post, this time to where Dyson was waiting. Astutely, he controlled before pulling the ball back to White on the edge of the area. Calmly and deliberately hitting the ball high, he found the top of the net as Atlético’s Uruguayan goalkeeper, Edgardo Madinabeytia, flayed helplessly at the ball. Defenders looked aghast at being two down and one lay flat out on the pitch distraught, as if in disbelief. Spurs were two goals clear and at the break would have been feeling that things were running in their favour. After the restart though, as so often is the case, things would change. Less than two minutes into the second half, a neat piece of interplay between Collar and Chuzo saw the former exploit space on the Spurs right flank. The ball squared into the area and after a brief scramble, a shot was fired in by Mendonça. It seemed destined for the top corner until tipped around the post by a flying save. Unfortunately, it wasn’t the hand of goalkeeper Brown. Covering behind his ‘keeper, Ron Henry felt compelled to palm the ball clear to prevent the goal. In modern money, it would be as obvious a straight a red card as you can get, but back then, it brought the inevitable penalty, but no further action. Collar netted efficiently, and Atlético were back in the game. The next 20 minutes or so saw the Spanish club’s best period of the game as the pushed incessantly for an equaliser, but the Spurs defence held out. Then, disaster struck for the Uruguayan goalkeeper. A throw-in on the left was played to Dyson, who neatly clipped the ball over his marker, collecting coolly and opting to cross into the area. The ball was poorly directed though and as two Spurs players advanced into the area before slowing and turning as the ball drifted towards Madinabeytia, the danger appeared to have passed. With no pressure on him though, the ball seemed to slip through the goalkeeper’s hands and dropped almost apologetically into the net behind him. It was a terrible moment for such an otherwise consistently reliable stopper who had performed so well up to that point. He walked from his goals and leaned on the fence in front of the crowd as if trying to escape the scene of the crime. It was a turning point in the game. Spurs had their two-goal advantage back and with just a quarter of the game to play, the Spanish team would have it all to do if they were to force their way back into the contest. For the next 15 minutes or so, Nicholson’s team concentrated on not offering Atlético a way back into the contest. Concentration and avoiding errors were to the fore and they slowly choked the life out of the Spanish team’s remaining confidence and hope. There were just ten minutes remaining on the clock when Spurs were awarded a free-kick on the edge of the penalty area. Blanchflower tapped the ball to one side and Smith tried to power in a shot, but it was blocked by an onrushing defender. The ball squirmed clear to Marchi who played it out to Dyson on the Spurs left. Yet another far post cross evaded everyone and Greaves galloped in – much as with the first goal – to put the ball into net and end any arguments about where the cup was heading. Spanish attacks afterwards were hardly more than gestures extracted from memory rather than hope, and the game drifted to its conclusion with Spurs as worthy winners. At the end, Kenneth Wolstenholme, commentating for the BBC remarked that Spurs had won “the European Nations Cup” confusing the new and still to be established tournament with the one contested by European countries. It may have illustrated how the Cup Winners Cup was still waiting to come of age, but for Spurs it was the win they had craved to put the cherry on the top of their period as a power in the English game. They had become the first British team to triumph in a European club competition. It was an accolade, no-one could ever take away from them. At the time of such triumphs there are often endings in sight and the game was the last major contest for Danny Blanchflower in the club’s colours. “’We finished the thing off properly,” the aging skipper recalled. Adding however that, “It was the last really good match I did play.” Three days after the final, Tottenham faced a league fixture away to Nottingham Forest, achieving a 1-1 draw, in which Blanchflower played. It would be his last game for the club. They completed their league programme two days later, losing 3-0 at Blackburn Rovers. At the end of the season, Spurs’ second place behind Everton may have been entirely creditable given their European exertions. 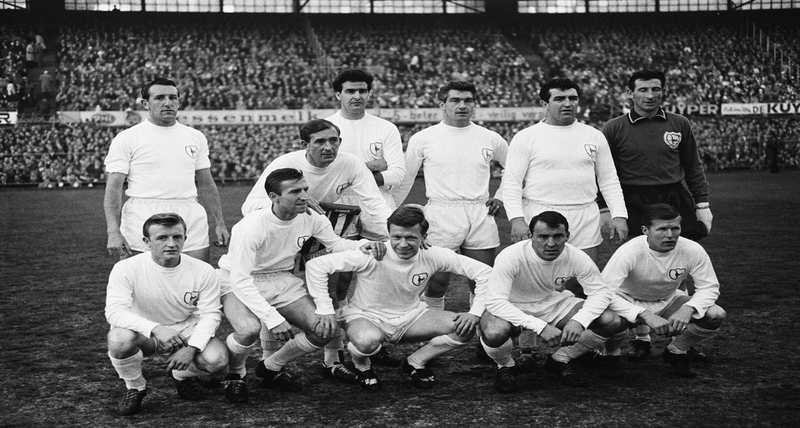 The club have, since, reprised the European victory of 1963, winning the UEFA Cup in 1972 and 1984. There is, however, something magical about being the first club to achieve something and for all future triumphs that followed and are still to come, that night in Rotterdam when a Spurs team denuded of Dave Mackay and containing a half-fit Danny Blanchflower overpowered the holders of the cup in front of just 4,000 or so of their North London fans, remains a unique experience. Whatever fortune the club will have in the future, for many, that night defined the ‘Glory, Glory’ ethos of the club for all time.